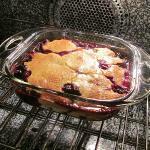 May 17 is National Cherry Cobbler Day. This fruit pie deserves its own holiday and today is a perfect day to bake cherry cobbler to celebrate with friends and family. Cobblers appeared in the USA in the 19th century, when English settlers brought their recipes. They didn't have equipment to make the same dishes as in Great Britain, that is why many of them were to be adopted. Exactly at that time appeared first cobblers, as the adaptation of suet pudding. Settlers had to improvise and added uncooked dumplings or biscuits on top of the fruit filling. For a long time cobbler wasn't considered as an appropriate dish for a party or to serve for guests. But everything changes and today cherry cobbler is one of America's favorites. You can bake cherry cobbler with bottom crust or with top layer only. Use canned, frozen or pitted fresh cherries to make the best cobbler. Add some vanilla or almond extract, lemon zest and nuts to make filling of your cherry cobbler even better!